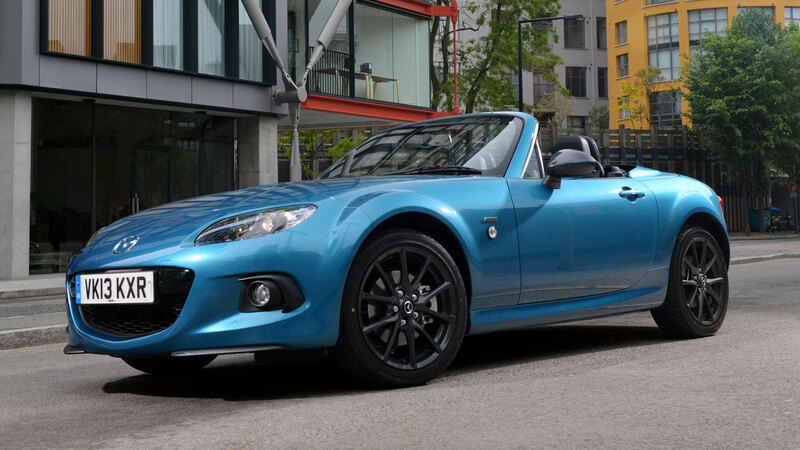 Delivering top-of-the-range specification, unique styling and sporty performance, the Mazda MX-5 ‘Sport Graphite’ Roadster Coupe is on sale now ready for summer, offering Mazda customers a stunning new limited edition of the world’s best-selling two-seater sportscar. Inspired by urban design, the new model’s exterior features eye-catching paint finishes that are unique to this model – Aquatic Blue Mica, Zeal Red Mica or Aluminium Silver Metallic – with a contrasting ‘Meteor Grey’ retractable hard top roof to create a highly distinctive appearance. The ‘Sport Graphite’ model is available with two engine options: the spirited 126ps, 1.8-litre or the sporty 160ps, 2.0-litre. Both derivatives feature the generous equipment levels of the standard model enhanced with an array of extra items. Every ‘Sport Graphite’ gains 17-inch dark gunmetal alloy wheels, black leather heated seats with unique grey stitching, 5.8-inch TomTom navigation system with integrated Bluetooth® hands-free kit, glossy dark grey fashion bars, colour-co-ordinated retractable hard-top roof and door mirrors all in striking Meteor Grey, and limited edition badges on the exterior and interior. 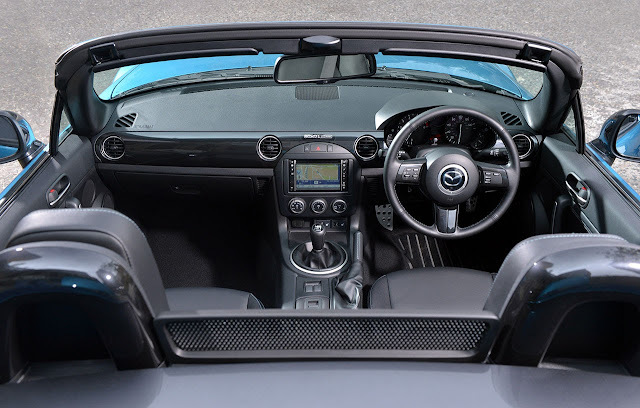 The design cues flow through to the interior of the Sport Graphite, with the unique grey stitching extended to the leather steering wheel and handbrake; glossy dark grey steering wheel spokes and dashboard panel; an alloy pedal set; and MX-5 floor mats with unique grey piping (additional cost). The generous standard specification of the limited edition MX-5 models also include: stainless steel scuff plates, body-coloured door handles, side, driver and passenger airbags, CD radio with Auxiliary jack and six speakers, electric windows, electric adjustable mirrors with heating function and climate control air-conditioning. 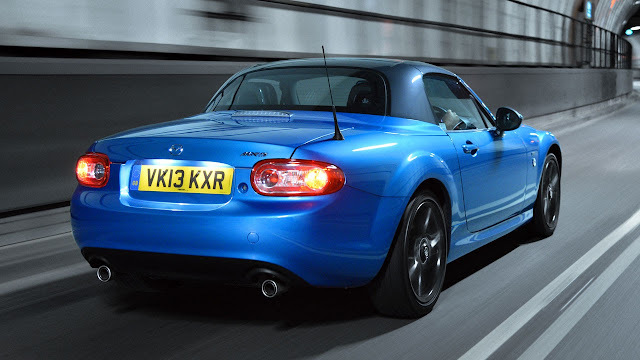 For optimum handling stability, all MX-5 models also feature Dynamic Stability Control (DSC) and Traction Control System (TCS). While the 2-litre Roadster Coupe model is also equipped with a Limited Slip Differential (LSD), cruise control, auto-dimming rear view mirror and Bilstein suspension. Each Mazda dealer is offering the first buyer of the Mazda MX-5 ‘Sport Graphite’, a signed limited copy graphite pencil drawing of the car. Drawn exclusively for Mazda by hyperrealist artist Paul Cadden, the 47 year old artist from Scotland, recreates photos or stills in amazing detail just using a graphite pencil, drawings that are often mistaken for photographs. The new Sport Graphite models represent excellent value. 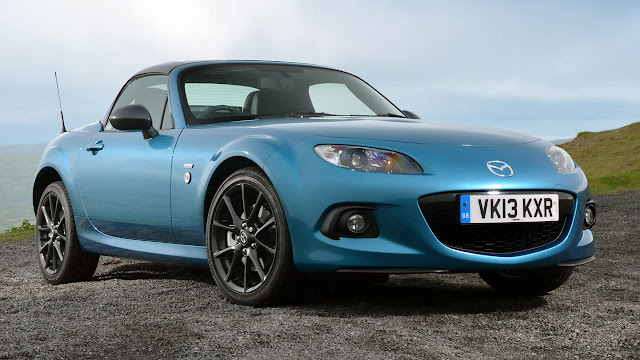 In the case of the 2.0-litre model there is an £800 saving against the equivalent Mazda MX-5 Sport Tech Nav. Until the end of September 2013, Mazda is making the new Limited Edition Mazda MX-5 ‘Sport Graphite’ highly accessible to its customers through some fantastic offers. Customers can take advantage of Representative 0% APR* finance with zero deposit and low-cost monthly payments from just £300. In addition, customers buying their new car with a Mazda PCP finance package will be offered a generous deposit contribution of £1,155, plus an additional ‘customer saving’ of £750 is available to all buyers of the Mazda MX-5 ‘Sport Graphite’. Current Mazda MX-5 owners will also qualify for a loyalty bonus of £500, with no requirement to part-exchange their existing vehicle.